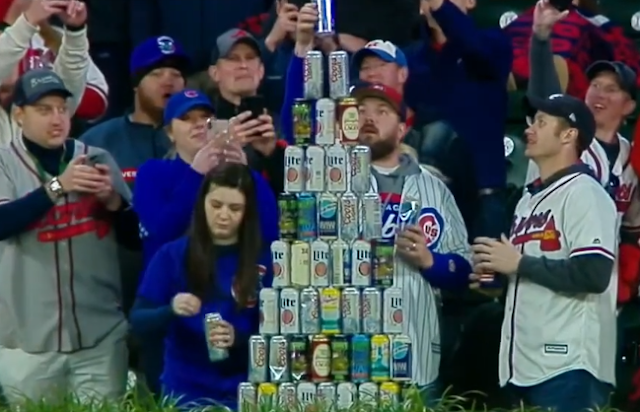 A Chicago Cubs fan found a positive outlet for his disappointment in his team's performance during Monday's game in Atlanta by building a beer can pyramid in the outfield. The Cubs were down 8-0 in the top of the ninth inning of the Braves' home opener when the fan caught the attention of television cameras with his impressive display. Unfortunately, just as he was about to finish his masterpiece with one last can, the entire pyramid collapsed. The Cubs fan was understandably disappointed, as all of us watching were, but he seemed to take things in stride.